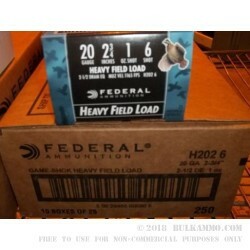 This is a 250 round case lot of the venerable performer in the Federal 20 gauge line of shotshells: the Heavy Field Load of #6 shot which is a great load for a variety of game animals, not the least of which, is the target animal from factory: upland birds. This allows good approach distance; good shooting distance; the power to properly dispatch birds the way it should be done. This is a moderate load, even by 20 gauge shotgun standards, but isn’t a heavy recoil felt at the shooter level. 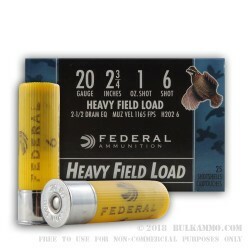 The heavy payload offers good stopping power with a full ounce of #6 shot in the flight controlled wad and the shell can be digested by virtually all factory mainstream shotguns; even including the semi autos without significant adjustment to the gas system. 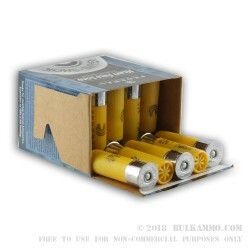 If you reload your 20 gauge hulls, these are top quality reloadable shells and offer a high base which maintains the reliability and can be used several times for reloading. 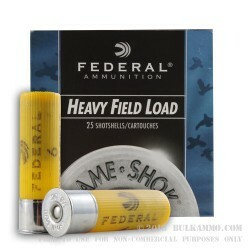 The Federal name is famous for their consistency and reliability; these shotshells are no exception. The 1165 feet per second velocity is enough to make them potent hunting loads and to keep them running smoothly in any of your shotguns they are chambered for.